This is one of four sculptures by Phillip Johnson dedicated in 2001 as part of the Turning Point Garden. They join the five other sculptures installed in 1997. 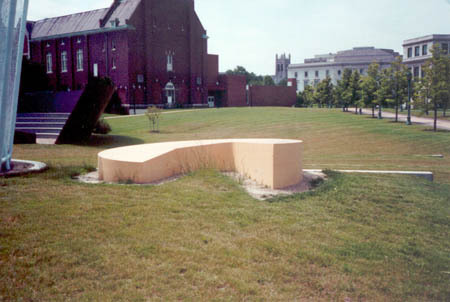 This yellow cresent-shaped bench is situated on a ground level concrete footing and occupies a place of prominence in the arrangement. The bench is one foot above ground level at its south end and rises gently upward to two feet at its north end. : Philip Johnson, “Turning Point Garden,” Ohio Outdoor Sculpture Inventory, accessed April 18, 2019, http://oosi.sculpturecenter.org/items/show/1024.